Stonehenge: Ancient Astronomical Observatory, Or Christo's Muse? This seems as good a time as any to write about my visit to Stonehenge on New Year's Eve. Not exactly the Winter Solstice, but we did ensure we arrived in plenty of time to avoid the fall of darkness, which hits southern England around 4:30 in mid-winter. A steady wind on the Salisbury Plain wrapped the cold around us and reminded us we were at 51 degrees latitude, further north than Moose Jaw, Saskatchewan. A rather ordinary highway, the A303, plows through bucolic English countryside toward Stonehenge. Suddenly the monolithic stones appear, rising off the Plain like ancient city skyscrapers. This city, though, is guarded by sheep and friendly English Heritage gatekeepers. We paid our fee (£5.20 adult, £13 family) and later traded up for membership in English Heritage , a sound investment that's already paid for itself. Many myths surround Stonehenge. Most people assume the stones were placed by Druids as a worship site. But the stones were in place 2000 years before the Druids ever got around to dancing sky clad under the full moon. So who were the early humans who built this "theme park" out in the middle of the woods? (Although the Plain is cleared of forest now, in ancient times the surrounding area was heavily wooded.) Just who carried these stones, weighing as much as 45 tons, from as far away as Wales? The best guess seems to be that the Stonehenge site was begun by the people of the late Neolithic period (around 3000 BC) and carried forward by people from a new economy which was arising at this time. These "new" people, called Beaker Folk because of their use of pottery drinking vessels, began to use metal implements and to live in a more communal fashion than their ancestors. Some think that they may have been immigrants from the continent, but that contention is not supported by archaeological evidence. It is likely that they were indigenous people doing the same old things in new ways. Stonehenge was built in three stages, starting in around 3000 BC until around 1500 BC. First it consisted of circular earthworks, where perhaps tribal meetings took place, or where ancient deities were worshiped--or both. Its alignment even then suggested a relationship with the midsummer sunrise. The stones were added later, beginning in around 2500 BC, when the four-ton bluestones were likely transported by rafts from the coast of Wales. The bluestones were arranged in a horseshoe pattern, and later were rearranged (in perhaps the earliest example of feng shui). Two or three hundred years later, the heavy sarsen stones, some weighing as much as 45 tons, were carried overland—and uphill—from the Marlborough Downs, 20 miles to the north. Humans did the work themselves, not contracting the job out to oxen or horses, using ropes and sledges. It's estimated as many as 500 men were needed just to move the stones, with another 100 to arrange the timbers used as rollers underneath. These were laid in a circular pattern outside the bluestones, inside shallow pits dug with picks made from antlers. Heavy lintels were then placed atop each pair of sarsens. To lift the lintels the construction workers probably erected a "crib" of timber frames, and constantly levered the lintel ever higher while raising the framing until it was equal to the height of the sarsens. Significantly, or not, the axis of the sarsen circle points toward where the sun would rise on the longest day of the year. Over the centuries, the stones were rearranged to adjust for the variation of the midsummer sun. This suggests the stone circle was some sort of astronomical observatory, or perhaps even a mere calendar—an important tool for an agrarian society. "Clearly, a lot of trouble was taken by the builders to put those things up — and some of the stones were brought from a long way away," says [Professor Christopher] Witcombe. "Which also, incidentally, signifies how important that spot on Salisbury Plain must be if they went to all that trouble to get those stones to that particular place." "It's not the stones that make it sacred. It's the spot that's already sacred, or holy, and then the stones are built," says Witcombe. Over the centuries, many of the stones have disappeared, used as building materials or destroyed. In the nineteenth century an enterprising blacksmith in Amesbury rented hammers to tourists hoping to capture souvenirs. The land was deeded to the government in 1918. What remains today is a remnant of what must have been truly awe inspiring, a monument to human achievement, regardless of its original purpose. Stonehenge is not as commercialized as I'd feared, but it could use its own museum, or at least an interpretive center. Currently, only a gift shop and a small snackbar muck up the atmosphere. A free handheld audio set is available, which provides a running commentary as you walk around the path that circumnavigates the stones. (Inner circle access is available by prior arrangement, during the hours the monument is closed to the public.) In Salisbury, 10 miles to the south, the Salisbury Museum displays many of the artifacts from the site. And if you aren't yet sufficiently impressed by what ancient peoples could accomplish, without so much as an HP calculator or an accurate watch, then head down to Salisbury Cathedral, a magnificent structure built in 1220-1258, and be sure to see the original copy of the Magna Carta displayed in the Chapter House. 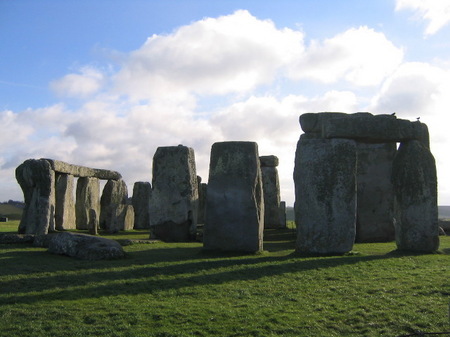 Located 90 miles from London, Stonehenge is open year round, except December 24 and 25, and Jan. 1. Where a man is a man. To the pipes of pan. Won't you take my hand. And oh how they danced, the little children of Stonehenge, beneath the haunted moon for fear that daybreak might come too soon. And where are they now? The little people of Stonehenge. And what would they say to us, if we were here...tonight."